performance is top priority and compromise is not an option The Fractal Meshify C PC case features unique lightly tinted tempered glass that beautifully displays your system so you can clearly see inside, this case also accommodates an open ATX layout with astonishing space utilization, which creates an unrestricted airflow path from the mesh front directly through to your key components making sure your PC is always cool. Fractal brings you the performance and capacity of a larger tower in an extraordinarily compact mid-tower size, this defiant striking chassis features an angular asymmetric design, constructed for the most streamlined build possible. lightly tinted tempered glass side panel This Fractal gaming PC case boasts an asymmetric design and offers a much lighter tint than the Meshify C TG Dark Tint, giving users a clear view into the inside of their case. 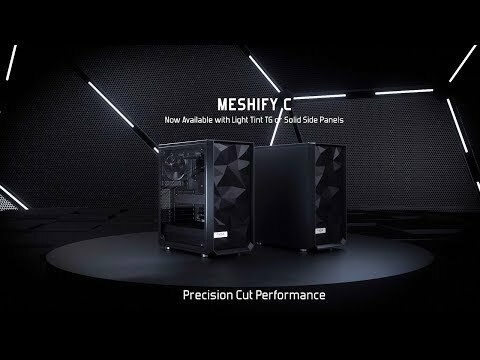 The Meshify C carves a space uniquely on its own as a new force in high-airflow design. TWO PRE-INSTALLED SILENT DYNAMIC FANS Your PC will run quieter and cooler with the Meshify C, as it features a newly designed angular mesh front panel and an open interior layout. The air intake and airflow is maximised to its greatest potential to ensure you get the cooling your rig needs. The Meshify C also comes pre-installed with two Fractal Design Dynamic X2 GP-12 120mm fans to deliver even more cooling efficiency. store up to five drives The Meshify C comes fitted with flexible storage options allowing you to fit your PC with up to five drives, situated at the bottom of the chassis to be cool at all times. These sturdy, steel drive trays come with vibration-dampening rubber grommets that cushion your hard drives to provide a quiet and reliable operation. FULL-LENGTH SHROUD FOR a clean build The included full-length power supply shroud covers your drive cage and excess cabling to further optimize airflow and give your rig a clean looking interior for an impressive overall build. DEDICATED SPACE FOR FURTHER CABLE ROUTING The Meshify C comes with up to 35mm of space behind the motherboard plate with convenient grommeted pass-throughs so all your cables can be cleanly stowed away. HASSLE-FREE FILTERS FOR EASY CLEANING This superior chassis comes with easy-to-clean filters on the front, top and base with full PSU coverage and convenient front access to make cleaning your PC easier than ever. Fractal Design Meshify C TG Light Tint, Mid Tower Computer Chassis, w/ Tempered Glass Window, ATX/mATX/mITX, 2x120mm Fan is rated 4.5 out of 5 by 2. Rated 4 out of 5 by Razzy from Tight with good airflow Nice case for price with good airflow but tight fittings in some places (recommended not to use an HDD with and go with M.2's and SSD's) like the HDD cage taking up alot of useful room for cable managment from power supply and space for a third 120mm front fan. depending on your ATX board then you will have issues with fans and AIO sizes.